The arctic wolf can survive in sub zero temperatures for months on end. They are also accustomed to the long dark winter months. Arctic wolves usually live in packs. A pack can be anywhere from two to thirty animals. The arctic wolf is one of the few animals that still roams over all of its original territory. Wolves will roam over huge distances to find prey. Their natural hunting grounds are the northern most islands of Canada, parts of Alaska and Greenland. It is believed that the wolves migrated over the ice to Greenland. Scientists have learned a great deal about the life and habits of wolves from the arctic wolf. One of the main reasons for this is that arctic wolves tend to be more curious than afraid of humans. This is probably due to the lack of previous contact between the two species. Arctic wolves will dig a den in the snow to have their puppies. If the ice is too hard they will seek a cave or a rocky area. If none of these things is available they will have the pups out in the open. The puppies are usually born in May or June. An arctic wolf will usually have betrween two to six puppies. The entire pack helps to feed the litter. Arctic wolf pups are a yellowish color. Their coat gradually gets whiter as they age. Arctic wolves are the only kind of wolf that is not considered to be endangered. Although their numbers are not large, scientists do not consider them to be in any danger. One of the primary reasons for this, is the fact that even the Inuit live for the most part further south than they do. Their territory is virtually untouched. Arctic wolves are slightly smaller than their grey cousins. The average male wolf will grow to be about three feet high and will weigh between 75 and 150 lbs. Wolves in the wild have a much shorten life expectancy, only about seven years, compared to a captive wolf which may live closer to twenty. 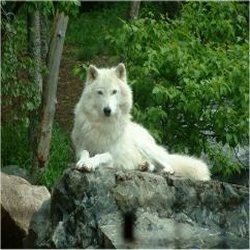 This entry was posted in Animal Trivia and tagged Arctic Wolf Facts, Arctic Wolf Information, Arctic Wolf Trivia, Wolf Fact Trivia, Wolf Facts, Wolf Infornation, Wolf Trivia by Jane. Bookmark the permalink.